Madison, Wis. — U.S. Secretary of Commerce Penny Pritzker announced that the Madison Region Economic Partnership (MadREP) is one of twelve new designees in the Investing in Manufacturing Communities Partnership (IMCP) initiative at yesterday’s U.S. Manufacturing Summit. Led by the U.S. Department of Commerce, IMCP is a multi-agency program designed to leverage economic development funds and accelerate the resurgence of manufacturing nationwide by supporting the development of long-term economic development strategies. In her remarks at the U.S. Manufacturing Summit, Secretary Pritzker singled out MadREP by commenting on our “ambitious strategy,” the only recipient to receive such an exclusive mention. To advance existing regional strengths and leverage key regional assets, MadREP applied for IMCP designation in the Agriculture, Food, and Beverage (AFB) manufacturing sector – an industry in which the region boasts historical, locational, and infrastructural advantages. 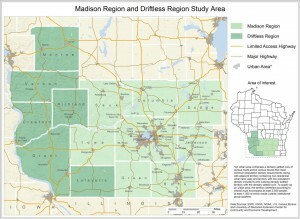 The IMCP region includes the eight-county Madison Region, augmented by six partner counties in south-central and southwestern Wisconsin for the critical role their assets play in the region’s AFB sector. Thirty projects were included in the comprehensive strategy, spanning workforce and training, supplier network, infrastructure/site development, research and innovation, trade and international investment, and operational improvement and capital access. As an IMCP designee, MadREP and its partners will receive coordinated support to navigate federal resources from dedicated federal liaisons at eleven federal agencies, which combined have over $1 billion available in federal economic development assistance. Designees also receive branding and promotion as a Manufacturing Community to help attract private investment and partnerships. MadREP is now one of just twenty-four IMCP designees in the nation. Being awarded this designation affords MadREP the opportunity to access significantly greater federal dollars in the future for the Agriculture, Food and Beverage industry as well as other regional sectors, and will be an asset positioning the region to attract talent, technology, and resources. “We feel that this designation positions MadREP to bring in significant federal dollars for workforce development, infrastructure, centers of excellence and global development initiatives,” says Bill White, Chairman of MadREP Board of Directors. In receiving the designation, MadREP President Paul Jadin offered thanks to the grant writing team led by MadREP Senior Vice President of Economic Development Michael Gay, including Enterprise Development Director Craig Kettleson, Project Specialist Jin Park-Higbee, and UW-Extension State Specialist Matt Kures, who was a significant source of data for the application. “I am delighted that the work on which MadREP and our staff has been focusing has gained this incredible recognition. The benefits of this designation will bring economic support and expertise to assist the City of Madison and the region in furthering development of major economic projects,” says City of Madison Mayor Paul Soglin. “This designation puts us toward a faster track to a dairy processing/management certificate, and we look forward to working with MadREP on that project and on accelerating global outreach efforts,” adds John Lucey, Director of Center for Dairy Research. MadREP will learn more about next steps through imminent communication with the EDA. To learn more, view MadREP’s full IMCP application, or read the overview provided by the EDA. MadREP is the economic development agency for the eight-county Madison Region, founded by business and community leaders to create a dynamic environment where people and businesses prosper. MadREP is the lead agent behind the region’s five-year Advance Now Strategy for economic growth, which is a five-plank platform consisting of economic competitiveness, innovation & entrepreneurship, human capital, marketing, and leadership & diversity. Through these five goal areas, MadREP and its partners aim to proactively and strategically position the region to take advantage of economic and business development opportunities. MadREP’s Manufacturing Community includes the Madison Region’s eight counties — Columbia, Dane, Dodge, Green, Iowa, Jefferson, Rock and Sauk – as well as Crawford, Grant, Lafayette, Monroe, Richland, and Vernon counties.